There has long been a real concern regarding the dangers of a British garden dweller, although it’s probably not what you would expect. While it hasn’t got sharp claws or long fangs, and isn’t going to attack you in the middle of the night, this devil-in-disguise can pose quite the risk to your livelihood; in particular, your home. Knotweed, commonly known as Asian or Japanese knotweed, is a large, herbaceous perennial plant that has successfully established itself in and around Europe since being introduced from the East around 200 years ago. The main issues regarding the plant are: its ability to grow up to 4 inches per day, roots that can extend three metres in depth and seven metres in all directions, and it’s unbridled strength, which gives it the ability the grow through concrete (albeit, previously damaged concrete), posing a real threat to the foundations, wiring and plumbing of your home. So much of a threat, in fact, that in extreme cases it can render homes unsellable. Some mortgage lenders may often reject any property affected by the invasive species, although many take a more pragmatic view and will lend if the plant is being eliminated by a reputable organisation and where appropriate insurance backed guarantees are supplied. This, however, can be expensive work. Because of the likelihood that knotweed will be found regrowing in a garden, even after it was seemingly removed, companies charge for, not only the poison-type removal treatment often used which normally lasts for a year, but also options of 5 to 10-year guarantees which may cost up to £7,000. Currently, estimated costs of controlling the plant within the UK sit at £165 million a year, and research carried out by YouGov has suggested that almost eight out of ten people would be less inclined to purchase a property if they discovered knotweed growing in the garden because of the risks it poses and the difficulty there can be in getting rid of it. Recently, a bungalow in south Wales was found to be accommodating knotweed unawares in the garden which, when found by a surveyor, devalued the bungalow from £130,000 to £70,000 when put on the market. So, how do you identify this pest? Well, re-emerging from the ground in spring, red/purple shoots sprout from pinkish buds that grow rapidly into bamboo-like canes of up to seven feet tall. These canes have characteristic purple flecks and produce branches along its length. The plant’s leaves are large and heart/shovel-shaped, and during the summer months whitish coloured flower tassels are produced. Garden forums and blogs offer a range of empirical and practical advice regarding knotweed. On their blog, Mowers Online stressed the importance of distinguishing between knotweed and a similar-looking plant called bindweed, which hastily grows up and along anything it can, suffocating and killing plants, shrubs and trees. This plant can be deadly to other plants, although it is much easier to eradicate than knotweed, as you can chop away the bulk of the plant before destroying the roots with boiling water. While it is possible to handle knotweed yourself, using various methods of chemical or non-chemical means, because of the serious issues that can arise from the plant and not getting rid of it properly, it is recommended that homeowners contact professional companies to do the dirty work. It is particularly important to refrain from strimming or mowing the plant as this can cause it to spread and regrow, even from pieces as small as a thumbnail. With an estimated 5% of UK properties likely affected by the plant, it is highly recommended that property buyers are pragmatic in identifying if a potential home is infected. If a potential property does have knotweed in its garden, it may not be overly wise to allow the current tenants to deal with the issue, as cheap or lackluster attempts at removing it may not be adequate and the plant may return and continue to wreak havoc. Property sellers do have an obligation to disclose the presence of knotweed during pre-contract enquiries, and estate agents also have an obligation under consumer protection regulations to advise buyers on any issues surrounding a property that might affect buying decisions. 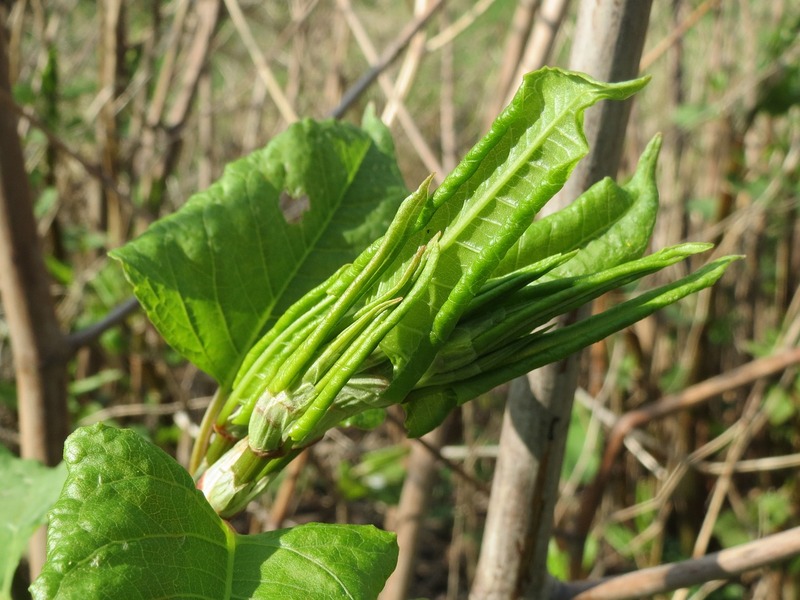 As scary as this plant seems, stories surrounding Japanese knotweed can be exaggerated. Nevertheless, with the high possibility that it’s presence can determine the sale or price of a house, it’s certainly worth checking the garden to see if it’s lurking the there.